In order to further understand the specifics of GNM occlusal adjustment concepts. the K7 uses its own unique Scan 12 EMG occlusal timing and first tooth contact high low chart patterns (5.5 mV) to accurately correlate temporalis anterior and masseter muscle group during functional clenching modes. Myotronics technology already has its own first tooth and muscle EMG response timing format allowing the skilled and detailed dentist to identify 10-20 micron occlusal prematurities using a coordinated high low first tooth contact chart. It is important to recognized a myo-trajectory should be determined using Scan 4/5 with TENS to identify a physiologic mandibular path of closure in order to assure proper occlusal refinements are done correctly and accurately. The following is an example of a scan 12 data while patient is being adjusted instructing patient to clench 3 successive times along their myo-trajectory. Note the hyper EMG before and after clench indicates the level of CNS activity prior to the clenching response as well as CNS EMG after the clench also showing a lack of calmness to the musculature. The following K7 Scan 12 displays after adjustment readings of the same patient. Improved EMG fasiculation before and after clench. Timing of the muscle activity responses during functional clench are now balanced to 5.5 mV levels indicating a very high quality of occlusal balance detail. Synchronized occlusion (balanced EMG responses) along the correct myo-trajectory is now displaying before and immediately after clench EMG quiet zones. This data displays the CNS’s muscle responses to the occlusal adjustment. This calmness before and after each clench shows the quality of the occlusal adjustment and balance at a 10-20 micron level. Underlying muscle tension related to an abnormal occlusal balance. The pink triangle on the sagittal plane represent the the amount of tooth structure that would need to be ground away (measured in square millimeters area) to accommodate an optimized mandibular closure along that isotonic mandibular path (slightly anterior) to the habitual voluntary trajectory. Any value greater than 0.2 mm or more is an indication that adding up on the posterior occlusal surfaces would be more conservative in treatment than grind precious enamel away (subtraction). A value lower then 0.2 mm would qualify for conservative equilibration (enamalplasty) to accommodate an optimized mandibular closure with the habitual voluntary closure path. Pathologic closing events vs. reproducible physiologic healthy closing events. The quality of the occlusal adjustment becomes clearly evident as to whether the central nervous systems response to a dentists occlusal adjustment is satisfactory or not to meet the CNS requirements of physiologic health. Many of my patients are very very picky. They can feel fine things at less then a 67-100 micron thick occlusal wafer which is what other EMG timing technologies used. This is one of the primary reasons why I don’t use those technologies. They are not detailed enough for my type of patients I see. Other technologies may be good enough for the 80% of the TMD patients who are not occlusally aware at a level of less than the 67-100 micron levels of awareness. Remember a human hair diameter can range from as low as 17 microns up to 100 microns. If the patient is highly proprioceptively aware individual they may fall into the 15-20% of those requiring a higher level of occlusal refinement as well as a clinician who understands these levels of detailed awareness. Fine accufilm 20 micron marking paper is also used with simultaneous TENS to make sure that voluntary muscle closing jaw torques are removed. I would hate to waste my time adjusting to the wrong position when a patient can be a 15-20 micron aware person. I know various occlusal technologies works to the level a dentists appreciates. I appreciate the K7 and its real time accuracy. One can have a balanced EMG bite with hyper activity before and after clenching (dysfunction/pathologic) or one can have calm EMG activity before and after balanced clenching (healthy/physiologic). This is what Scan 12 shows me as to the quality of health and status of the CNS in conjunction with Scan 4/5. These are technological advances that other electronic technologies do not record. The recorded data tells me if I have correctly and effectively adjusted the occlusion on correct neuromuscular path to get my patients stable both structurally and neuro-muscularly. We know there can be reproducing pathologic closing events and there could also be reproducible physiologic healthy closing events. I believe most of us desire to adjust our patients occlusion to support reproducible “physiologic” healthy parameters. If one has a balanced EMG closing event but the patient is not closing along an isotonic path of mandibular closure and EMG resting patterns are show aberrant before clenching and aberrant after clenching resting EMG patterns… I believe we both would agree that this pathologic closure event is less then optimal. This is one of the reasons why I use K7 Scan 12 to see these patterns. I want to see the quality of my 20% challenging type TMD cases who are very detailed and are able to sense fine details well below the 100 micron threshold of occlusal adjustments. I rather not use EMG occlusal bite wafers that some use with other technologies that cause lip and muscle reactions to occur which then distorts the myo-trajectory jaw closure pattern. Based on these kind of raw resting EMG patterns I can see what level of quality is my occlusal correction. If I see resting fasiculation before a clench and after aberrant fasiculation (some call in pre and post synaptic) responses we know the bite no matter how balanced the EMG patterns are still indicate there is underlying CNS pathologies. How does one know….we can observe it with our K7 scan 12 . Because of this type of critical information I don’t want to ignore these factors, especially for my 20% challenging TMD cases who have often fallen through the cracks of having numerous levels of TMD failed therapies. 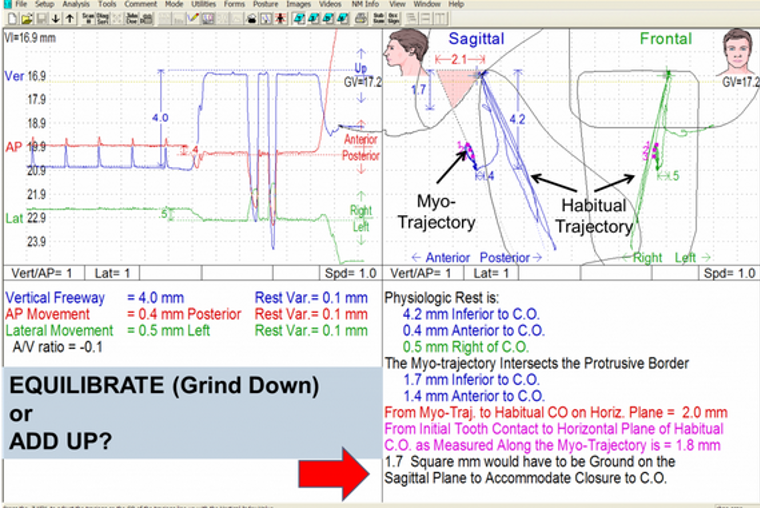 This is why I find it extremely important to determine and locate my patient’s mandibular myo-trajectory with TENS as discussed and presented above in this thread. What objective means does one use to measure that “physiologic” mandibular position when managing a TMD pain patient’s occlusion?